One carton of flavoured milk sold in Australia contains nearly as much sugar as half a packet of lollies, according to a new analysis from LiveLighter, a public health education campaign encouraging Australians to lead healthier lives by changing what they eat and drink and being more active. 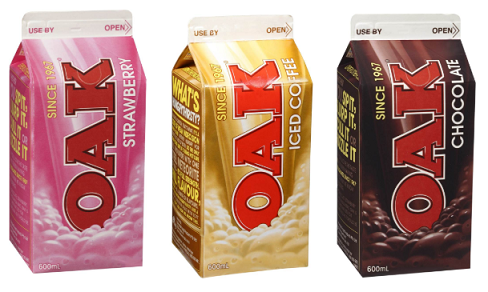 The survey of more than 90 popular chilled flavoured dairy milks from Victoria and Western Australia found some varieties contained almost as much added sugar as a can of cola. “Given the size of some of the flavoured milk drinks sold in store, you could be consuming more than 9 teaspoons of added sugar in just one drink – that’s almost as much as a can of cola,” said LiveLighter Campaign Manager and registered dietitian, Alison McAleese. 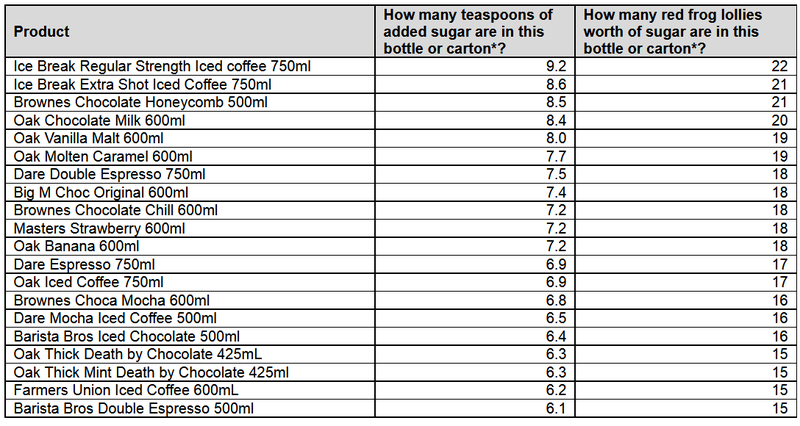 With more than 9 teaspoons of added sugar per bottle – the equivalent of 22 red frog lollies – Ice Break 750ml Iced Coffee was the worst offender. Ice Break’s 750ml Extra Shot Iced Coffee came in second with 8.6 teaspoons – or 21 red frogs worth – of sugar. Browne’s Choc-Honeycomb and Oak Chocolate Milk closely followed, with 21 and 20 red frog lollies (8.5 and 8.4 teaspoons) worth of sugar respectively. “You would never add nine teaspoons of sugar to milk yourself, so understanding the huge sugar content of these drinks should come as a wake-up call to consumers and help with changing habits,” Ms McAleese said. Drinks containing milk do offer health benefits. Plain milk contains many nutrients for good health, such as protein, calcium, zinc, vitamin A, vitamin D, iodine and vitamin B12. “All dairy milk contains naturally occurring sugars like lactose, which are not bad for health, however, flavoured milk also contains added sugars,” Ms McAleese said. Plain cow’s milk contains about 4 to 5g of naturally occurring sugars per 100mL (just over one teaspoon), but anything above is likely to be added sugar. LiveLighter encourages Australians to check the nutritional panel when considering flavoured milks or better still, switch flavoured milk for plain. “When choosing a milk drink it’s important to compare brands and choose the one with the lowest amount of added sugar per 100g,” Ms McAleese said. The following flavoured milks all exceed the World Health Organisation’s recommended maximum daily intake of 6 teaspoons of added sugar. For reference, a can of Coca-Cola contains 10 teaspoons of added sugar. There are approx. 45 Red Frogs in a 190g packet. *Estimated added sugar: milk contains approx. 5% naturally occurring sugar. Added sugar is in addition to this naturally occurring sugar. 1tsp sugar = approx. 4 grams.